one Handheld tool for VW/Audi/Seat/Skoda. Both KBus and CANBus cars are supported. Diagnose functions : support display information of ECU's, read out trouble codes of ECU and erase them, Login/Security Access to ECU. more functions will be added later( output test, read live data, coding, basic setting, adaption, etc.) 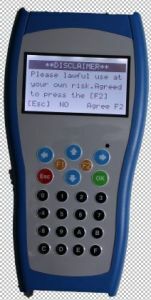 Supported protocol : KWP1281, KWP2000, and CAN TP2.0 Special functions : Odometer Correction, Read PIN Code , Add new Keys(via OBD2 connector only)! KBus covers up the models 1994-2004 such as: Audi A3, A4, A6, A8 separate immo box 1994-2009. Almost all VDO instrument clusters for VW/Seat/Skoda up to year 2008 .
some Passat B6, Bora/Jetta, Polo to 2004 year, Golf 4, Sharan to 2005 year. some Skoda Octavia/Fabia to 2005 year. some Seat instrument clusters up to 2005 year. some Audi instrument clusters (IMMO3). more instrument clusters will be added later (Motometer, Bosch and Magneti Marelli, etc.) CANBus covers up the new generation of instrument clusters from 2004 for VW / SEAT /SKODA/Audi such as: new VW models, such as Golf V, Caddy, Touran, Passat B6, Jetta etc. SUPPORT VW/AUDI IMMO PIN READER,INCLUDE IMMO1(IMMOBOX),IMMO2(INSTRUMENT),IMMO3(INSTRUMENT). Read information of ECU, Read DTCs and erase them. Login/Security Access to ECU. Special functions : Read immobilizer pin from engine ECU, Immobilizer box and instruments. Immo1, Immo2, Immo3 and WFS are supported. And it can add new keys to cars without known pin. because pin can be read from car. It supports odometer correction too. VWTool -- one Handheld tool for VW/Audi/Seat/Skoda. Diagnose functions: Support display information of ECUs, read out trouble codes of ECU and erase them, Login/Security Access to ECU. Special functions: Odometer Correction, Read PIN Code, Add new Keys(via OBD2 connector only)! Audi A3, A4, A6, A8 separate immo box 1994-2009. Almost all VDO instrument clusters for VW/Seat/Skoda up to year 2004. Some Skoda Octavia/Fabia to 2004 year. Some Seat instrument clusters up to 2004 year. Some Audi instrument clusters (IMMO3). New VW models, such as Golf V, Caddy, Touran, Passat B6, Jetta etc. And some Audi models, such as Audi A3, Audi A8 etc. Functions: Transponder match, code adjust, odometer adjust and resive, and failture test. SUPPORT VW/AUDI IMMO PIN READER, INCLUDE IMMO1(IMMOBOX), IMMO2(INSTRUMENT), IMMO3(INSTRUMENT). SUPPORT VW/AUDI KM CHANGING. DISPLAY OLD KM, DIRECT ENTER NEW KM, DO NOT NEED COMPUTER.